What is The Cash Flow Dam? What Is The Cash Dam and How Does It Work? The Cash Dam (sometimes referred to as a “cash flow dam”) is a simple but powerful concept, and it’s an especially attractive option for those who are familiar with the Smith Manoeuvre or other tax minimization strategies. Cash Dam can help you with tax optimization if you have a mortgage and own either a small business or a rental property. The Cash Dam allows the owner of a small business or rental property to more quickly pay down their non-deductible mortgage on their home. It’s a variation on the Smith Manoeuvre, but without additional investing. The Cash Dam is essentially an expedient way to change bad debt into good debt. For someone who’s using the Cash Dam, what it involves is using a line of credit to pay for business expenses. Then, while using the increased business cash flow, you pay down a non-deductible mortgage or loan. This, in turn, produces an increasing tax-deductible business loan, while paying down a non-deductible mortgage or loan. Be advised that the Cash Dam as described above will only work for those who own a non-incorporated personal or partnership-based small business or a rental property. If you own a small non-incorporated business that has $2,000 in expenses each month and you also have a readvanceable mortgage, then the $2,000 per month expense would be paid by the home equity line of credit (HELOC). You then use the additional $2,000 you have in your business expense account to make a payment on your non-deductible mortgage. Interest paid on money that’s borrowed for business expenses is tax-deductible; by using the Cash Dam, you’ll be left with a tax-deductible business loan and a non-deductible mortgage that’s been quickly paid down. One of the keys to the Cash Dam, however, is capitalizing the interest on the business line of credit. That way, you avoid using any of your own cash flow and you keep the business line of credit tax-deductible. How does the Cash Dam differ from the Smith Manoeuvre? The Cash Dam relies on using a tax-deductible business loan to allow you to pay down a non-deductible debt, while the Smith Manoeuvre allows you to buy investments. Investing from your credit line is why the Smith Manoeuvre has much higher risk and return than the Cash Dam. Say that you’re a rental investor, instead of using your own cash flow to pay for rental-related expenses, you can use the Cash Dam and a line of credit. In this instance, using the Cash Dam would help you pay for your personal mortgage and help you satisfy your tax obligations as well. And if you are a small business owner, the Cash Dam can be extremely advantageous. The strategy gives you a way to quickly pay down your non-deductible mortgage and convert that debt into a tax-deductible business loan. Many investors are skeptical that there exist fund managers who have skill and who can beat the index over the long-term. Other investors believe that there are fund managers who have skill, but that it’s impossible to identify them ahead of time. There are skilled fund managers that can be identified ahead of time. I know quite a few of them. You just have to look using the right criteria. When looking at funds, many investors take an objective approach and study recent returns, look at ratings or statistics, or try to forecast which sectors will perform well. Other kinds of skill evaluations are more subjective and rely on insider judgments, e.g., doctors assessing other doctors, or even actors judging performances of their peers. The evaluation of a fund manager falls somewhere in between those two approaches, the objective and the subjective. I believe that, to find the best fund managers, you have to study them, not the fund. Start by finding fund managers that have beaten their index over their career or long periods of time. This could be in more than one fund. They do not need to beat the index every year – just over time. Then study them to find out how they do it. Is it because of stock-picking skill? Outperforming the appropriate indexes is just one factor in the criteria. Top fund managers are usually not trying to secretly follow the index–they’re more likely to have an effective style (like value investing), and have high “active share,” which means that they’re investing in a way that differs from the index; they also often have great experience and have their own money invested in the funds that they manage, i.e. “skin in the game”. One of my special skills is identifying all-star fund managers — it’s essentially my main focus related to investments. I’ve found around 50 fund managers over the years who I would characterize as having superior skill, and all of them have beaten their index over long periods of time. Most of those 50 managers are on my “watch list”. I own only a handful of those funds. Although I’m resistant to the idea of sharing statistics about my own personal investments, mostly because my investment style may not be suitable for every investor, I want to emphasize that it’s possible to identify skilled fund managers early and ahead of time. I won’t ever own an ETF or an index fund because I’m not happy with below-index returns. I choose investments based on the fund managers–I want to invest with the Albert Einstein of investors, the absolute best. ETFs and index funds don’t have fund managers, so I’m not interested. The goal of investing is to obtain the highest long-term return after fees, and a skilled fund manager provides enough value to pay for those fees and more. There are really two options when you’re pursuing above-index returns: one, you can find yourself an all-star fund manager, or, second, you can choose a portfolio manager who’s paid by performance fee. When portfolio managers are paid by performance fee, they’re motivated to beat their index. If they don’t beat the index, the fees are similar to ETFs. If they do beat the index, the fee pays for itself. Getting above-index returns is all about finding skill. Ed Rempel is a well known Canadian “Financial” Keynote Speaker and shares his enthusiasm and many years of experience to primed financial audiences that want, need and deserve more and better insight and information. Join Ed Rempel a senior financial industry expert with a host of other top speakers at the Canadian Financial Summit. 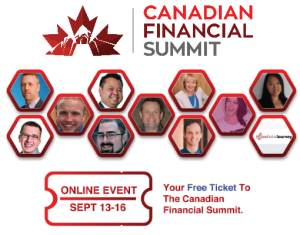 www.canadianfinancialsummit.com September 13-16 Online Event.